Make sure you start with good quality steak, preferably with a nice bit of fat and well hung for a minimum of 21 to 28 days. The Pan. Make sure you use a heavy pan and get it really hot so that you can brown and caramelize the steak when sealing it. Don’t mess with the steak, just leave it and let it brown and sizzle don’t keep prodding or turning it, the less messing the better. Brush with oil before dropping into the pan. Marco Pierre White suggests mixing a Knorr beef stock cube with a little olive oil into a paste and coat the steak with that before frying. He swears by it. 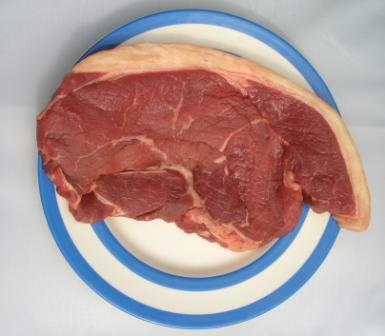 Season steak with good quality sea salt like Maldon Sea Salt before frying. For a medium cut steak, that is, not cut very thick, 2 to 3 minutes per side should give you a medium rare steak, increase timings for medium and medium to well, if you want it well done reconsider !! go on try it medium or medium to well. The steak touch or poke test, people use various systems but here are the main two I am aware of! Compare the softness in the fleshy muscle part of your thumb when you poke it with your finger to the feel when you prod the steak with the same finger!! so for rare steak it should feel like your thumb touching your index finger, for medium rare – thumb touching your middle finger, medium – thumb to ring finger and medium to well done your little finger. After you’ve tried this method you’ll get the idea, how it should feel follows. Let me know your own top steak tips…. This entry was posted in Food, Steak, Yorkshire Dales Food and tagged cooking, Food, frying, Meat, medium, pan, rare, Steak, tips, well done. Bookmark the permalink.